In a moment of synergy between a presidential election year in the United States and a First Senator election year in the New Republic, the recently-released novel Star Wars: Bloodline by Claudia Gray gets a special advertisement that asks: What is Princess Leia Trying to Hide? The ad is set up like a political attack ad, even paid for by the Centrists, the opposing political party in the novel. In the book, the Senate of the New Republic decides - on both sides of the aisle - that they need some kind of new, centralized leadership. They decide to vote in a First Senator, instead of a new Chancellor, someone that would be able to guide along the voting process more cleanly, but didn't necessarily wield unilateral power in any way. As a respected member of the Senate and a war veteran, Leia gets pushed into nomination - until, as the ad and cover and title of the novel hint at, an old secret of hers rears its dark, heavily-breathing head. 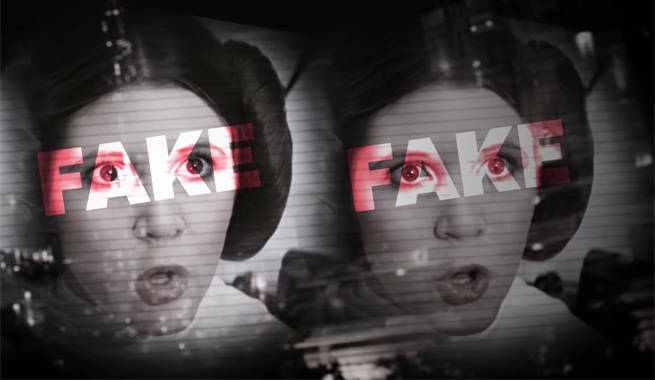 Of course, Star Wars isn't actually against Leia, and some of the elements used in the attack ad are just plain silly. Her killing of Jabba the Hutt, in fact, is celebrated in the pages of Bloodline. Claudia Gray used that instance coming up as a chance to fit the fan term "Huttslayer," which fans offered as an alternative to "Slave Leia" into canon. We'll let you read the book yourself to see how and why, though. Bloodline is on shelves now (and very good), and if you think the political climate is bad in the U.S., just wait 'till you see how bad it is in a galaxy far, far away.